Are you a running enthusiast? Do you care about your health? Or do you just want to have fun and help at the same time? Here's something for you! 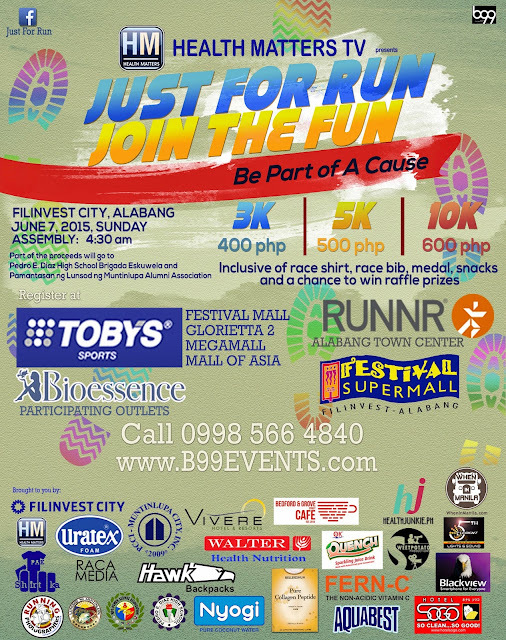 Health Matters TV, a lifestyle and health show hosted by Paolo Abrera, partnered with B99 Event Management in organizing JUST FOR RUN, JOIN THE FUN. In line with the show's aim of promoting healthier lifestyle, everyone is encouraged to join this fun-filled run on June 7, 2015 in Filinvest City, Alabang. Sign up now and be part of a cause that supports our youth. 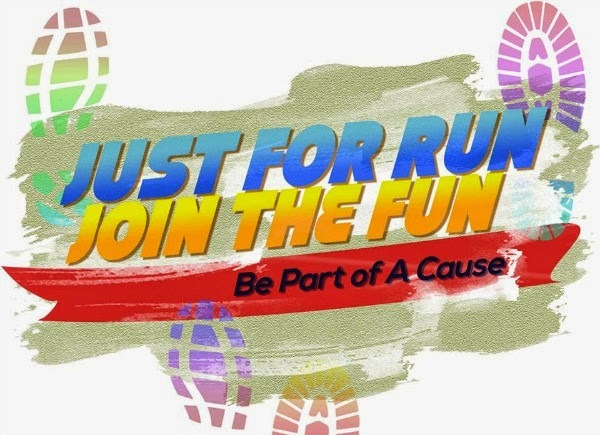 JUST FOR RUN, JOIN THE FUN is also a benefit run for the students of Pedro E. Diaz High School and Pamantasan ng Lungsod ng Muntinlupa. Everyone can join. You can choose from the following categories: 3K (400PhP); 5K (500PhP); 10K (600PhP). Fees are inclusive of race shirt, race bib, medal, snacks, and a chance to win raffle prices. Join the Run! Register in the following venues. Register now and receive a limited edition button pin and lots of our goodies. 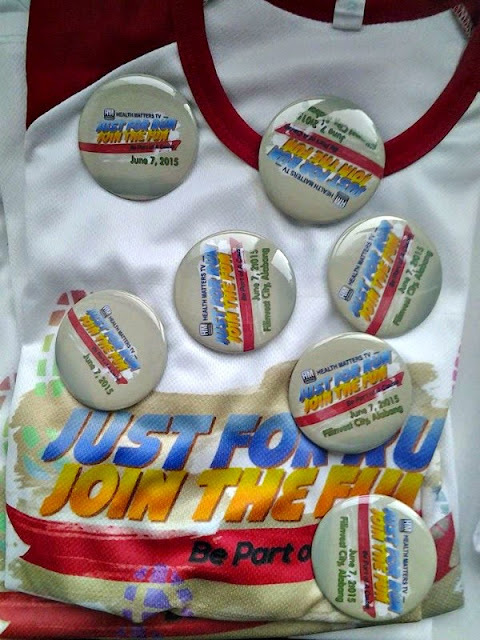 Join the run and receive loot bags from our sponsors on June 7. Approach our sponsors’ tents; join the special games they prepared and win gift certificates and other prizes. This event would not be possible with the help of our generous sponsors. Special thanks to (Major sponsors) Hotel Sogo, Belleieshua Collagen Peptide, Toby's, Runnr, Festival Mall, Filinvest City, (Minor sponsors) Uratex, Hawk Backpacks, Nyogi, Ok Quench, Aquabest, Walter Bread, Blackview, and Bioessence. We'd like to acknowledge our Media Partners, Health Matters TV, WhenInManila.com, and HealthJunkie.ph, and our official photographers, Running Photographers. Online registration is extended until June 3, 2015. Register here! If running is not for you but you care about your health, then you can check out this Health Matters TV event happening on the same weekend. Health Matters TV is a block-timer in ANC (ABS-CBN News Channel), aired on Saturdays at 8 PM with a replay on Sundays at 11 AM. Season 2 – pilot episode aired on May 16, 2015.